I found some time (and a blackbird-free window!) to spend in the garden yesterday afternoon. After pottering around looking after my seedlings, and repotting my salmonberry, I had to do some watering. April has been uncharacteristically dry, I don’t think we’ve had any rain to speak of this month. Everything in a raised bed is doing OK, but things in containers were starting to wilt. Then I had some jobs to do in the front garden. A horse chestnut seedling had appeared in one of the planters beds, so I dug that up and potted it separately – Ryan is trying to bonsai one! 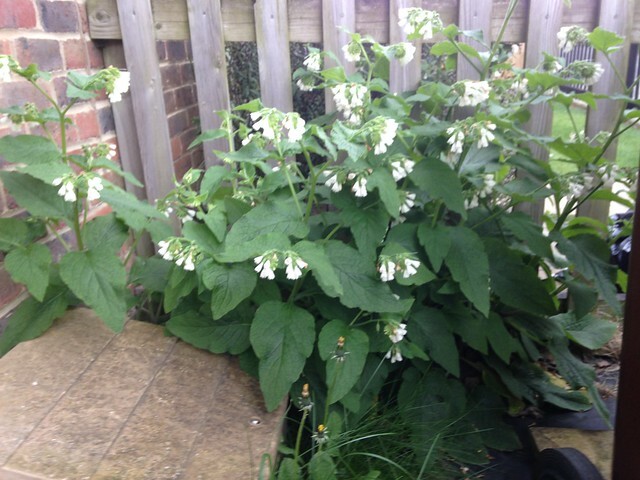 The wild comfrey that lives next to the front door is in flower at the moment, and I am leaving it (and the dandelions!) for the bees. The ice peach has finished flowering, and created pink petal confetti over the front path for a few days. But it had started flowering, with white flowers, from shoots coming out of the rootstock. (A quick search suggests that the rootstock is Rootpac-20, a plum tree hybrid (Prunus besseyi x Prunus cerasifera)). 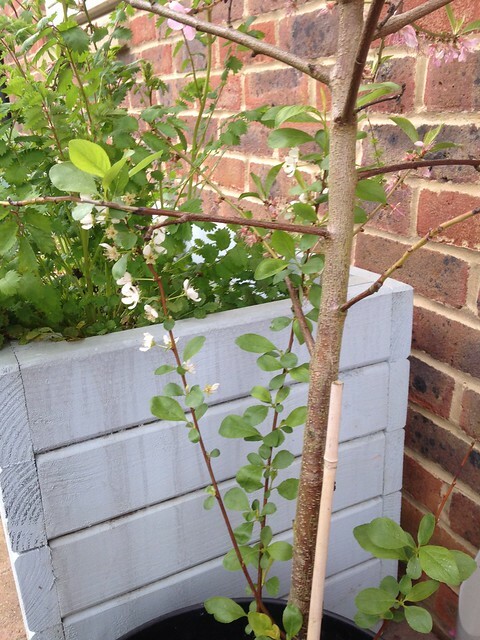 These shoots have to be removed, or growth from the rootstock will overtake the peach in time and leave me with a plum! So I have pruned them out. 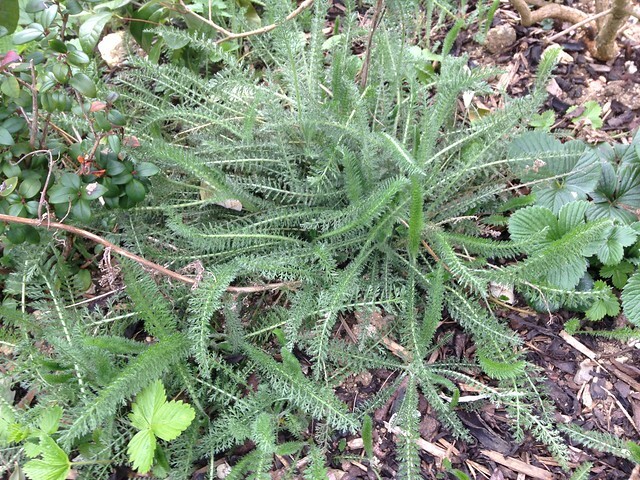 When I planted up the front garden last year, I included a couple of yarrow plants that I’d rescued from the ‘lawn’ before we started building the back garden. I added them in because I like their feathery foliage, but it has proved to be a mistake. They grew quite large, and overshadowed some of the Chilean guavas, and now they have spread – both by seeds and by creeping stems (stolons). I have weeded them out as best I can; I suspect it is one of those jobs that will have to be done in batches.